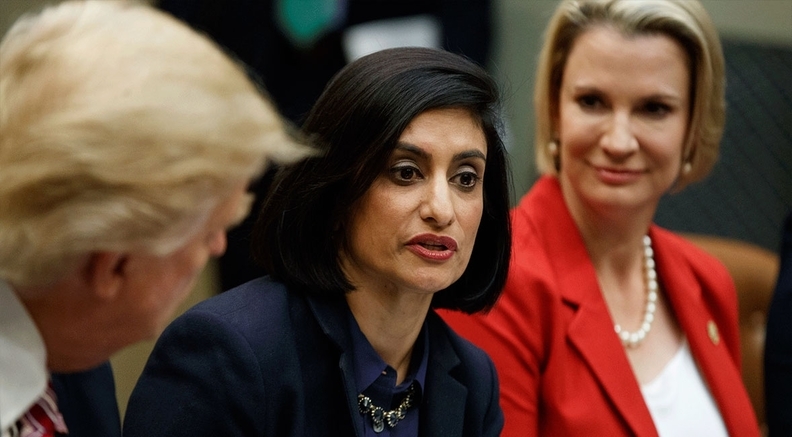 CMS Administrator Seema Verma Thursday said Medicaid work requirements are having the right impact, despite criticisms about Medicaid coverage losses for the poor. Welfare's success should be measured by how many people leave welfare, Verma told policy insiders at a Medicaid Managed Care Summit in Washington. Success, she added, is "realized through sweat, toil and initiative." Interest in Medicaid work requirements has jumped recently with states such as Alabama, Michigan, Tennessee and Virginia posting draft waivers for comments on their Medicaid websites in September, the first step before sending proposals to the CMS for review. Several other states have already submitted their requests to the CMS. The upcoming midterm elections could affect whether select states expand Medicaid and whether work requirements will have legs. 1. Verma touts Medicaid work requirement successes, despite coverage loss: Verma insisted that Medicaid work requirements are working as intended to move people out of poverty, despite criticism that they're doing more harm than good. 2. Hospitals, insurers wage political battle over managed-care dollars: Medicaid, the federal-state health coverage plan for the poor, has devolved into a political inter-industry feud in the impoverished Mississippi Delta. 3. Could deep-red Miss. expand Medicaid? 2019 will tell: A Mississippi state senator has introduced a bill to expand Medicaid every year since Obamacare went into effect, but so far it's been off the table. The 2019 governor's race could change the picture. 4. Close governor races could decide future of Medicaid: Advocates say the single biggest factor in expanding Medicaid in balky states has been the election of a governor who supports it. The Trump administration's overall success in promoting Medicaid work requirements could be influenced by some key gubernatorial races. 5. Editorial: Want people off Medicaid? Give them more access to it: New research found those who gained coverage through Michigan's Medicaid expansion faced fewer debt problems, fewer evictions and bankruptcies, and saw their credit scores rise just years after enrolling for coverage. 6. Tennessee joins push for Medicaid work requirements: Tennessee is the fourth state in September to introduce a work requirement proposal for its Medicaid enrollees. Officials there believe it has a better chance of CMS approval than other states that haven't expanded Medicaid due to its coverage policies for adults. Join the conversation about Medicaid work requirements on Twitter.